The OFA recently called for a suspension of FIT contracts until the noise and electrical issues of wind turbines are settled (good on them). So, the OFA, Liberal red to the core has abruptly thrown down the gauntlet and the Liberal caucus had no plan for war with its last ally in rural Ontario. What really made the OFA do this? Besides the obvious panic that renewals might not be forthcoming, I found this comment by a local farmer both interesting and very believable. A small news item was announced 2 days before the OFA proclamation last week: a lawsuit by John and Sylvia Wiggins, who own a horse farm near Stayner. They are suing their neighbour who is the host landowner for a wind project of 6 turbines. Last summer they listed their 48 acres for $1.15 million and though initial interest was intense, buyers disappeared after the wind farm was announced. They are suing the wind company, WPD and the host landowner for $3.5 million for lost value. 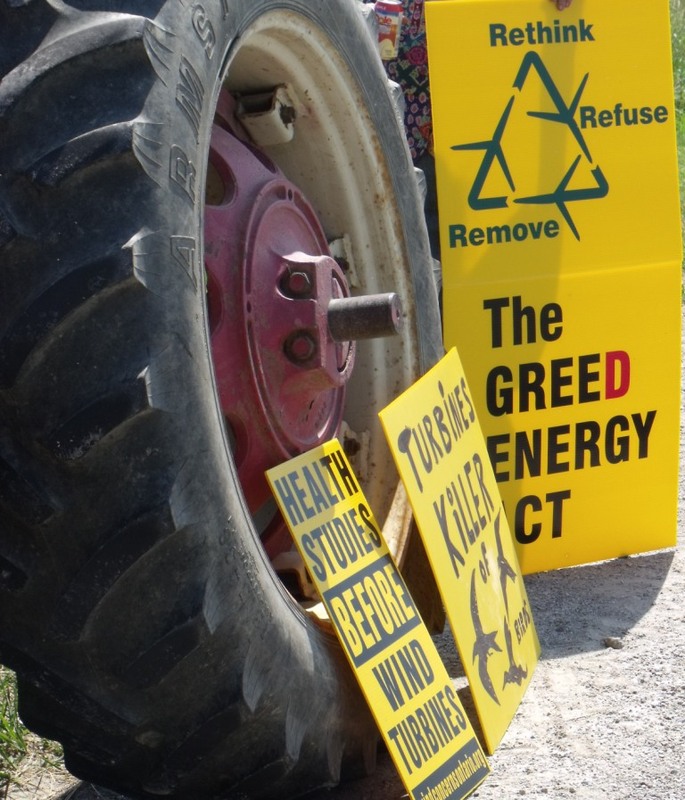 This is the first time a landowner has been named in a civil suit involving wind turbines. It was bound to happen. There is case law to support the position, one being a situation back in the 1980’s where neighbours of a go-kart track in Niagara Falls successfully sued the landowner of the track. Their claim of loss of property value was accepted by the court. If the Wiggins are successful it would open the flood-gates to more lawsuits. Given the obvious visual (nuisance) impact of wind turbines, I’d say there is a high likelihood they will win. The farmer said there is a real danger of “spill-over” effect. A win may provoke challenges against current farming practices based on noise, odour, view, whatever. That’s something that all rural residents had better think carefully about. The OFA already is, and they are spooked. Meanwhile, our dim-witted government insists that we rural residents are quite happy to accept wind turbines, “…for the greater good of society.” Like H… we are -suffer in silence so some comfy condo dweller can mitigate his urban guilt. NO! Posted on January 31, 2012, in Agriculture, Green Energy Act, Take Action, Take it to court. Bookmark the permalink. Leave a comment.